Editor’s note: Ross Rubin is principal analyst at Reticle Research and blogs at Techspressive. Each column will look at crowdfunded products that have either met or missed their funding goals. Follow him on Twitter @rossrubin. Bikes and tech go back a long way. During his first stint at Apple, Steve Jobs would talk about how, when one compared the efficiency of various animals in advancing a kilometer, humans fared poorly, a distant species from the class-leading condor. But when you did the same comparison with a human on a bicycle, humans blew away the pack. The idea of computers as a “bicycle for the mind” was a theme he would repeat, and “Bicycle” was even floated as a name for the Macintosh. Jobs, of course, was not the only adult enamored by bicycles; the two-wheeled wonders are prized by a huge community of enthusiasts ripe for the pedal peddlers at Kickstarter. Whether your New Year’s resolution was to tone up under the premise of “two wheels good, four wheels bad” or are looking to match your attraction to being ecologically green with limited-edition Kickstarter green, a number of recent projects have offered new takes on urban mobility. Backed: Bicymple. Capable of riding in a straight line with its rear wheel parallel as well as ultra-tight turning radii, the compact and nearly symmetrical Bicymple is distinguished by the lack of a chain and the placement of pedals on the rear wheel. However, Bellingham, MA-based designer Josh Bechtel admonishes that it’s not a “two-wheeled unicycle,” citing the ride as very different (and hopefully more favorable to the balance-challenged) and ignoring that such a thing would be an oxymoron. Reward tiers to bag a Bicymple of one’s own range from $800 for the fixed-gear model up to $2,700 for a two-gear model, which may be as many as you can get away with while trying to stress simplicity. Despite the pricey merchandise, the project beat its $20,000 funding goal by more than half with about 40 days left to go in the campaign. In a rare and welcome move, Bechtel has set the delivery date at December 2013 but notes that he’s giving himself room to wiggle as much as the Bicymple’s wheel and expects to fulfill orders well before that. 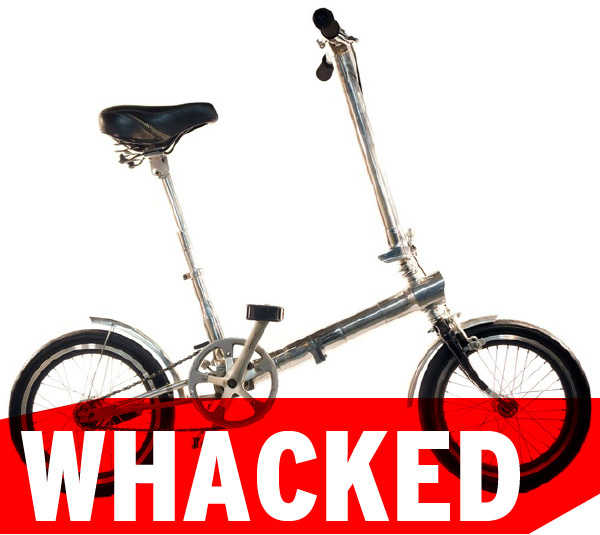 Whacked: NexiBike. It may seem like a bold statement to say that your invention will be “a game changer that will revolutionize human-powered transportation.” That statement, though, comes from Scott Olson, who, with his brother, developed the Rollerblades that Olson also claims revolutionized human-powered transportation. It may not have done that, but it did revolutionize the roller skate. Olson’s latest pursuit, a 25-lb. foldable bike that you can carry with you onto public transportation, looks a bit like a steampunk project folded up. Unfolded, it’s characterized by its small wheels and the seeming promotion of a comfortable, un-hunched riding posture. More portable but less attractive than the Bicymple, the NexiBike needed $100,000 for its production. And while the bike’s puncture-proof tires may resist flattening out, the campaign could not. With about 17 days to go, it has collected less than $3,000. Whacked: Zuumer. The NexiBike revolution may have to wait, but at least two folding bike projects did make their funding goals in years past: the Brooklyn-born CMYK Folding Electric Bike and what would become the Model Ue curve-framed electric bike (now slated for delivery this year). 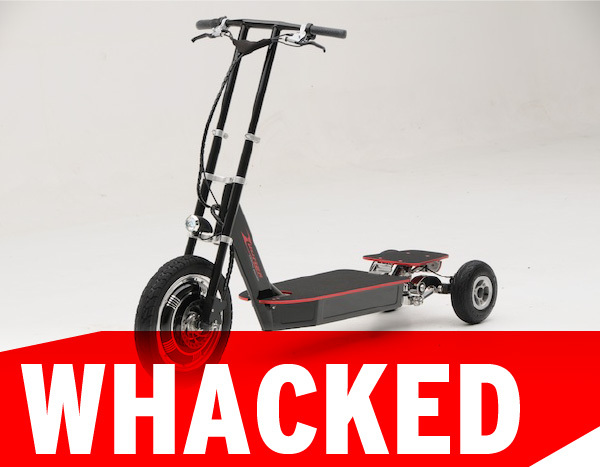 There’s also been at least one electric scooter, the sleek but whacked JAC< from the Netherlands. The Zuumer (not to be confused with the Honda Scooter or Palm-developed PDA sold by Casio and Tandy Corp. in 1994) adds a second rear wheel to the electric scooter, and “lean-in” steering that allows 300 lbs. of flesh and cargo to travel up to 20 mph before being recharged. Most of the 23 early-bird Zuumers, priced at $2,300 each, are still left, with the next reward tier jumping $500 for the same thing. But one may need to wait a while to find out who’s zooming whom. With 20 days left, Zuumcraft has attracted only about $17,000.